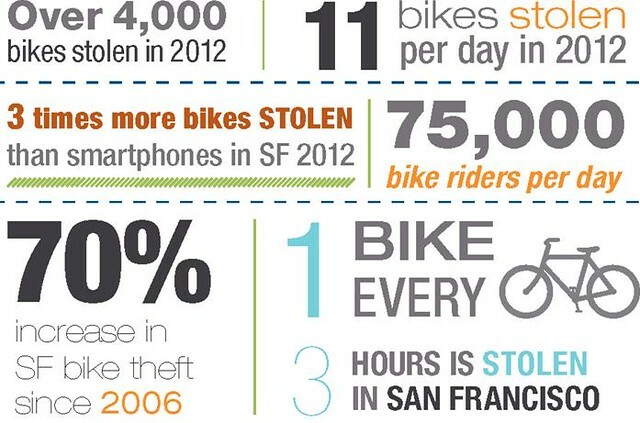 Not even we who post about biking are immune to the horrors that plague the bike world – like getting your bike stolen! In my case, it happened right out from under my nose (literally) just outside my apartment window…. and I think that’s what shocks me most of all. 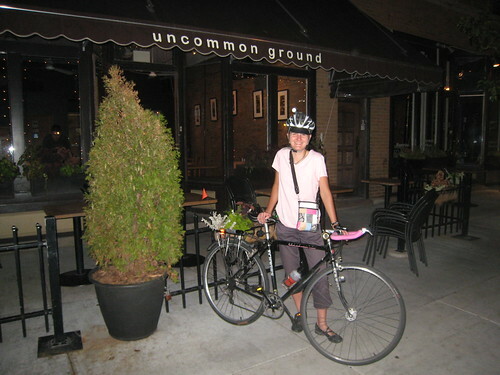 I always approached my cycling life with the full realization that my bike could be stolen, and I purposely rode a bike that I felt “comfortable” locking outdoors in the theft-prone urban environment. I never expected the thieves to find me at home, which leaves me feeling more vulnerable and shell-shocked than ever. 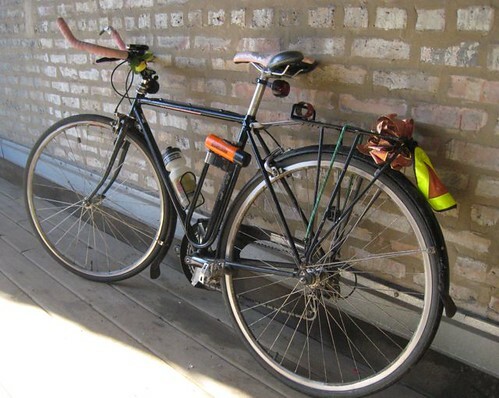 Since realizing what happened, I have filed a police report, posted the theft to Craigslist and Chicago’s Stolen Bike Registry (I’m not the only theft lately! 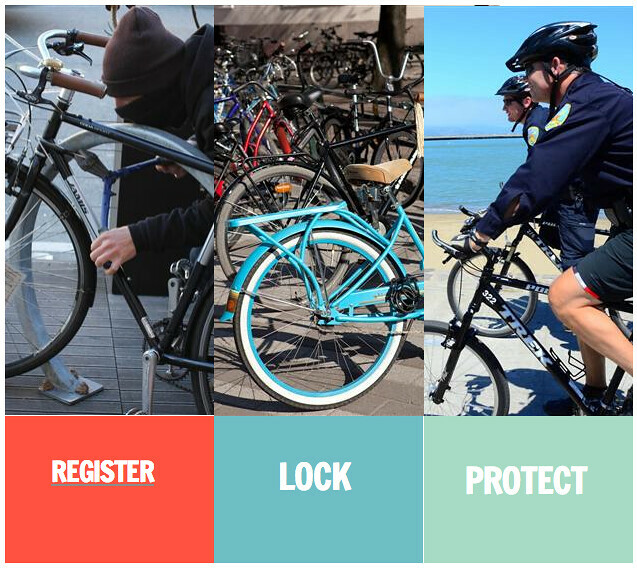 ), posted the theft to several local blog sites known in Chicago (The Chainlink and Everyblock), and reached out to friends in the biking community. I’m pleased we are a small and supportive group. Luckily, just a couple of months ago after giving a bike safety seminar at work for colleagues, I did record my bike’s serial number and registered it with the city (and affixed a pretty green registration sticker on my seat tube down near the bottom bracket). When I called the police, the officer completely sympathized with my loss – something I hadn’t expected – and the officer was also very pleased to hear that I had the serial number and knew my bike’s distinguishing features. Of course I did! It’s MY bike. If you value your bike, I suggest you get your bike’s serial number on file and make notes of what sets it apart from other bikes out there. In my case… the thieves left behind a trail of accessories from my bike… scattered down my alleyway, including the u-lock and reflective triangle that hung from the rear rack. 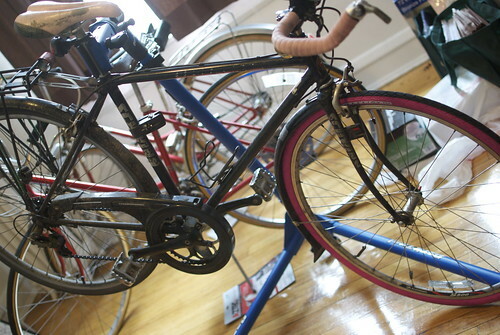 But they aren’t getting the wheels off unless they have the right tool for my bike’s locking skewers…. As with most losses, the value is not in the item stolen, but in the sentiment attached to it. This bike has the efforts of my friends in it who helped her become what she is, including a pink saddle from our very own Jack “Ghost Rider” and the fitting and customizations of my mechanically inclined friends. In case I’ve never told you, I do thank you for making Toro so special to me.